In order to guarantee a place for your child it is necessary for you to complete the registration packet and submit with payment. Please enroll promptly to ensure a spot for your child. 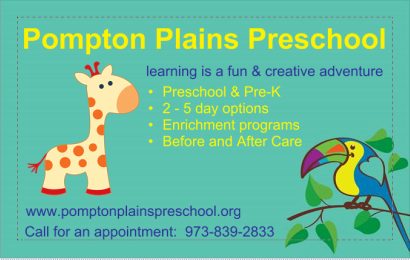 The child must be three years of age two years prior to the legally accepted date for entrance to kindergarten in the Pequannock Township schools. It is our policy that your child should be Toilet Trained by the start of school. We understand that toilet training is a major multi-step process that should be reinforced with positive encouragement. We do provide a "Potty Progress Chart" which we fill out during the week and send home for parents to keep the training consistent. We understand that accidents happen, we are there to encourage and assist in this very important process. Our staff is experienced in this process and will provide diapering/changing as needed. 2019-2018 Registration information is located on this page. Reserve your place now! ​Please complete and mail in the registration tuition form located on this page.